ALGIERS: At least 257 people have been killed in a military plane crash near Algeria's capital, Algiers, state media reported. It was not immediately clear whether there were any survivors. TV station Ennahar showed images of smoke rising from the plane's fuselage, tilted to one side, with part of the aircraft sticking out above olive trees. 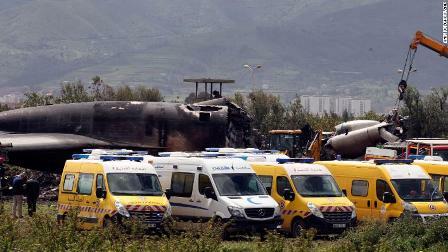 Dozens of bodies were seen in numbered bags as paramedics and firefighters worked at the crash site. Cranes at the site have begun trying to move some of the debris.